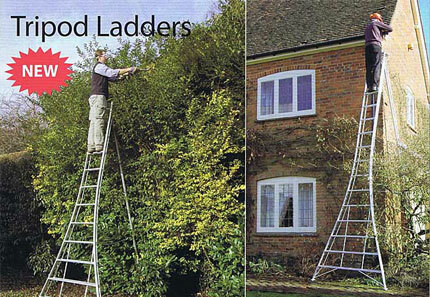 Tripod ladders have been in use for centuries and are typically best suited for reaching into (fruit) tree canopies, topiary work and awkward spaces. Three legs - with one or all of them adjustable - are quite easy to keep in full contact with uneven and sloping ground; making the tripod design more stable than typical (step) ladders. Re-developed in recent years, our Tripod ladder range allows you to work comfortably at height, even on sloping or soft garden ground, from a wide and stable base that won't wobble or suddenly sink in, and cannot easily be toppled. One or more adjustable legs allow you to keep the ladder level and stable, so you can get on with the job in hand with greater confidence and concentration. Wider two bar ladder rungs make for more comfortable standing for longer periods, because they are deeper. 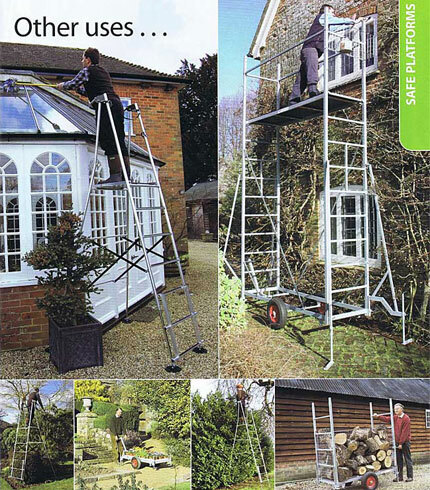 The ladder's lightweight, narrow top, and third leg design make it easily manoeuverable in very tight or cluttered spaces or to get into the canopy of trees. All Tripods are weatherproof and are built tough for frequent use. Choose from the 'Standard' (one adjustable leg). 'Fully Adjustable' (3 adjustable legs) or 'Platform' (extra deep rungs, one adjustable leg) Tripod ranges. In all other respects the three ranges are functionally the same, though some sizes are unavailable in the 'Fully Adjustable' and Platform' ranges.